Carrickedmond / Legan CE Clg ((which is funded by the Department of Social Protection) are looking to recruit a Community Employment (CE) Scheme Supervisor on a full-time basis. • Maximising CE participant’s opportunities for employment, training and development. • Liaison with the Department of Social Protection, sub-sponsors as appointed from time to time to deliver an agreed work plan, public and private training providers and employers. 1. A major third level qualification at National Framework of Qualification (NFQ). Level 6 or higher in a discipline relevant to the duties of the post. Evidence of the award / qualification must be included with the application (i.e. photocopy of award or results). 2. At least 3 years work experience in a supervisory capacity. Two employment references will be sought from a successful applicant who is under consideration for appointment. 3. Own transport and a full valid B driving licence. • Knowledge and understanding of Health & Safety Regulations. • Proficiency in the use of Information Technology (I.T.) software packages (e.g. MS Office). The successful candidate will be required to obtain Garda vetting clearance. 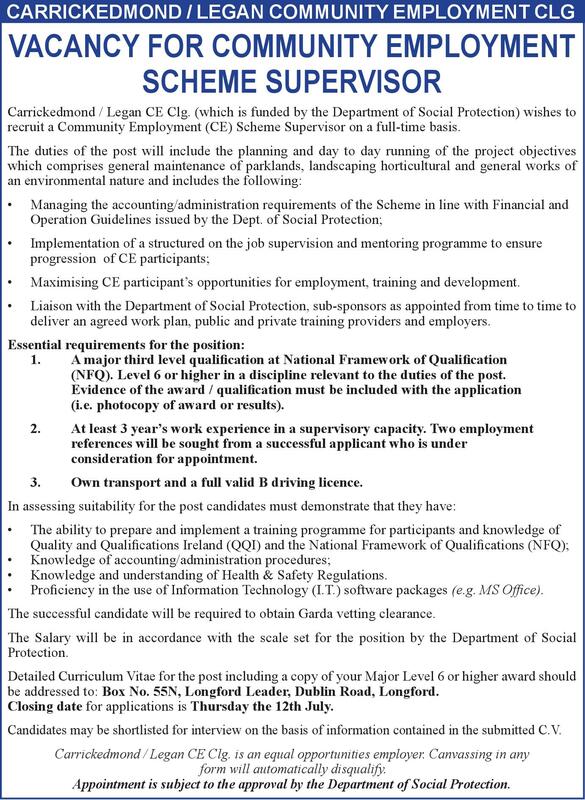 The Salary will be in accordance with the scale set for the position by the Department of Social Protection. Detailed Curriculum Vitae for the post including a copy of your Major Level 6 or higher award should be addressed to: Box No. 55N, Longford Leader, Dublin Road, Longford. Closing date for applications is Thursday, July 12. Candidates may be shortlisted for interview on the basis of information contained in the submitted C.V.
Carrickedmond / Legan CE Clg. is an equal opportunities employer. Canvassing in any form will automatically disqualify. Appointment is subject to the approval by the Department of Social Protection.